On October 3rd, Germany celebrates the 25th anniversary of Germany’s reunification. The newspaper “BILD”, equivalent to FOX news in terms of scandalizing, biased reporting and manipulating, has the highest circulation of any newspaper in Germany. On a hot topic day, they print 12 million papers. 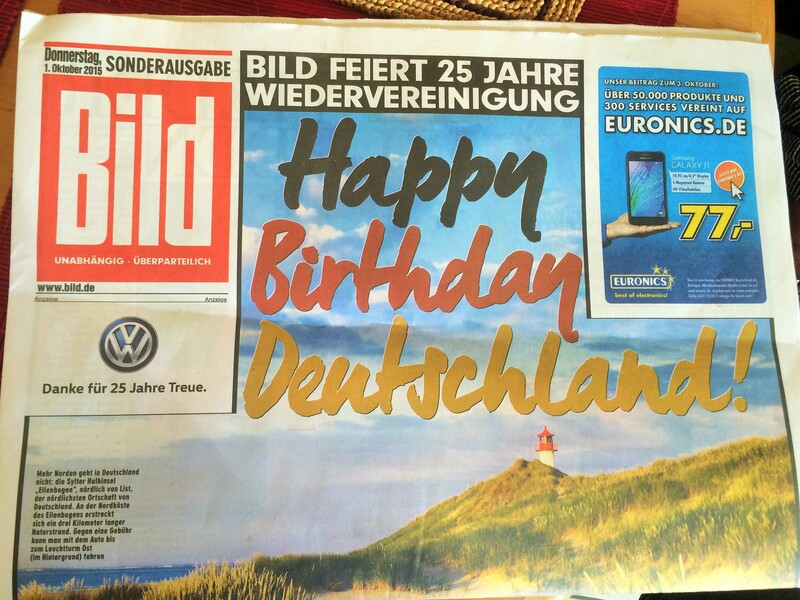 Today, in their “Happy Birthday, Germany” edition, the car manufacturer Volkswagen played an unusually prominent role: The company appeared on the first page, and occupied two full page-ads that I would like to explain to an international audience. 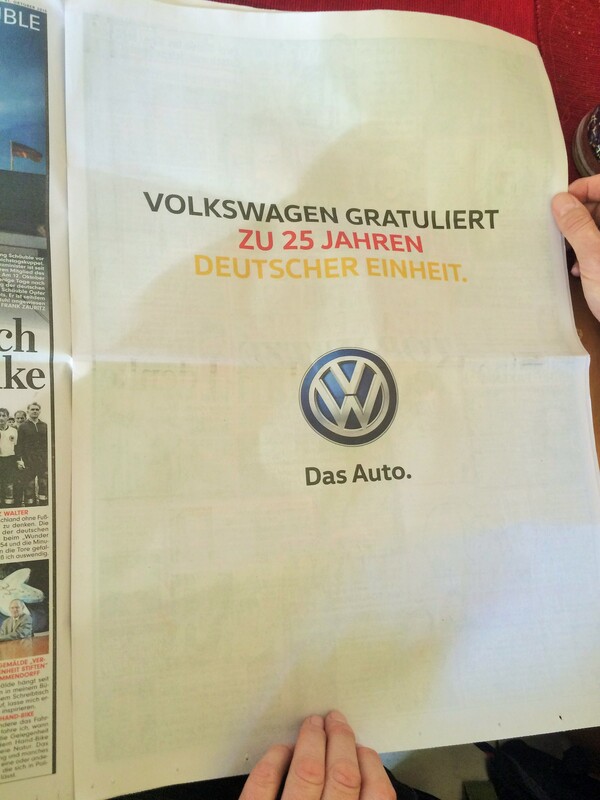 Front Page: Directly underneath BILD’s logo, there is a Volkswagen ad, saying: “Thank you for 25 years of faith”. Being a marketing professional, the location of this ad almost had me thinking whether this was a corporate publishing coup initiated by VW in partnership with BILD. To put this into the right context: “Unity and Justice and Freedom for the German Fatherland” is the first verse of Germany’s national anthem. There is a lot of room for interpretation of this ad. My first idea was that by substituting the word freedom with the VW beetle, they intend to say that VW has been the company who’s brought an affordable car to German households. You may also derive at the interpretation that as much as these values belong to Germany, so does the Volkswagen, which means “the people’s car”. What do I make out of this? The story of Volkswagen is a German story. While it is great that the company portrays its happiness about the country’s reunification that prominently, the question that remains is whether VW had planned this very expensive birthday card before or after the emissions scandal. In addition to that, no other traditional German company has placed birthday wishes in the paper and there are a couple of international companies with German roots like Bosch or Siemens. I come from a town that hosts the second largest Volkswagen plant in Germany. Many of my former school mates now work at the company. In the German language, there is an special way of expressing the identification with an employer. When asked who they work for, people don’t respond “I work for Volkswagen”, they respond “I am Volkswagen”. This region truly is Volkswagen, the local government’s prosperity and almost every sports team’s sponsoring depends on the VW. To me personally, VW has been the manufacturer of a car for a person that does not need to show off. Comparing the claims of the biggest German car manufacturers underlines this brand image. From BMW claiming Happiness (“Freude am Fahren”) or Mercedes stating The best or nothing (“Das beste oder nichts”) to Audi promising Advancement through technology (“Vorsrpung durch Technik”), VW simply offers the car (“Das Auto”). 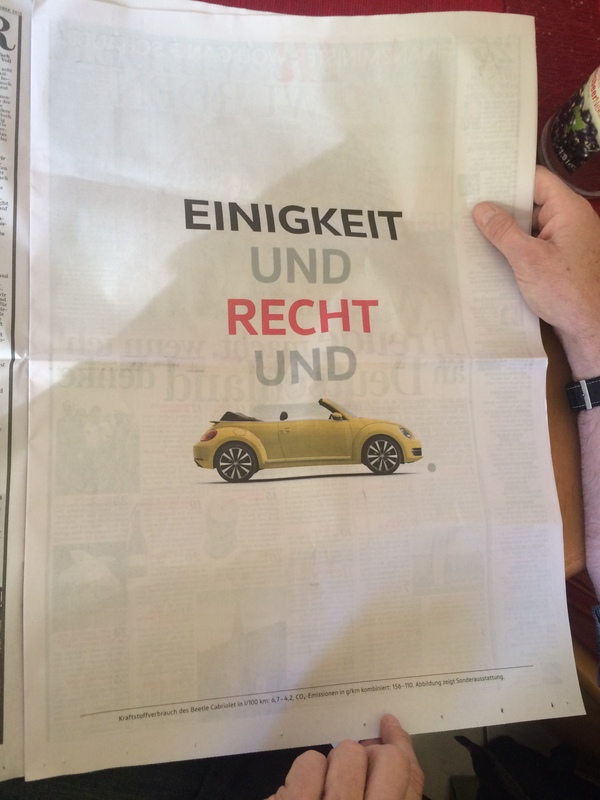 Not knowing about VW’s intentions to place these ads in this morning’s BILD paper, to me this presents a very bold move that is not in accordance with its humble brand image. I am curious about your thoughts! This entry was posted in Connecting Worlds, English Version, Neues von Tooi, Tooi´s Schreibereien and tagged Alltagsgeschichten, Marketing by franziskaschwarzmann. Bookmark the permalink.